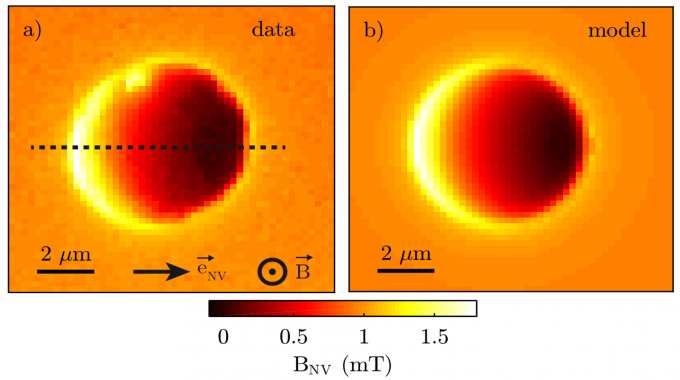 We report on direct, real-space imaging of the stray magnetic ﬁeld above a micro-scale disc of a thin ﬁlm of the high-temperature superconductor YBa2Cu3O7−δ (YBCO) using scanning single spinmagnetometry. Ourexperimentsyieldadirectmeasurementofthesample’sLondonpenetration depth and allow for a quantitative reconstruction of the supercurrents ﬂowing in the sample as a result of Meissner screening. These results show the potential of scanning single spin magnetometry for studies of the nanoscale magnetic properties of thin-ﬁlm superconductors, which could be readily extended to elevated temperatures or magnetic ﬁelds.